Every Etisalat user was worried when the information came few days back that the brand name Etisalat will be changed to 9mobile. Hopefully they changed to 9Mobile successfully and now they are coming up with great offer to keep their subscribers connected, no doubt when they say every business has a unique strategy. 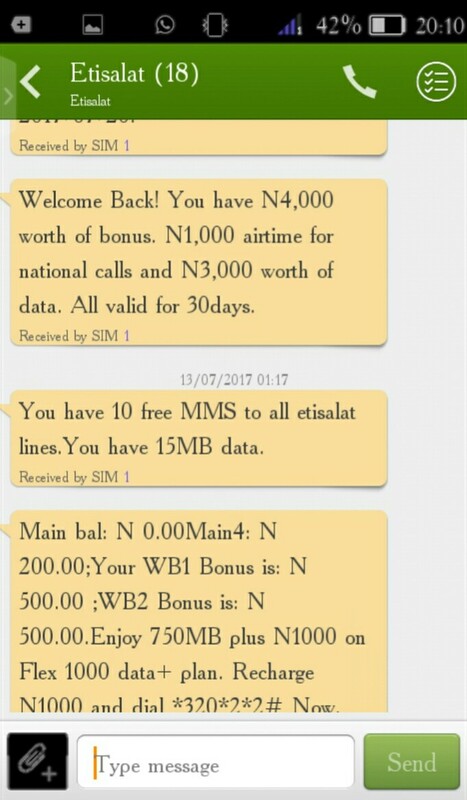 Right now, we have another bonus offer coming right from etibaba known as 9mobile, 😀 given out whooping 4'000naira, we also hope you have not forgotten about the Etisalat WelcomeBack that gives you Instant 750MB data for just N200, don't worry about how to go about it just scroll down slowly to get the full details. If you have Etisalat Sim that is dumped for complete 30 days or more this time for you to look for it dust it and insert into your phone, and you will be eligible to activate this bonus. Then, load your 200naira recharge card. Immediately, your recharge is successful, your airtime will be deducted and replaced with 4,000naira worth of airtime (1,000naira for Calls + 3,000naira for Data). Next, you will be credited with 4,000naira bonus. IMPORTANT: This bonus is eligible for some prepaid customers as a welcome back bonus. It's official! 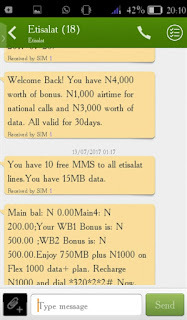 GET N4'000 ON ETISALAT Every Etisalat user was worried when the info came that the brand name etisalat will be changed to 9mobile. Hopefully they changed to 9mobile successfully and now they are coming up with great offer to keep their subscribers connected, no doubt when they say every business has a unique strategy.